In 1845, 3 years after free settlement was established in Moreton Bay, John Brennan purchased land in the Enoggera district. Other Catholic settlers including Thomas Hayes, Timothy Corbett, T Gollaher and Patrick Mooney and their families followed. They mainly engage in mixed farming. 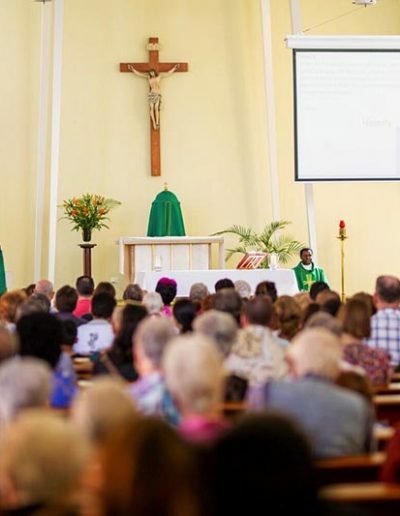 Catholic families from the area attended Sunday Mass at St Stephens in Brisbane, and later St Patricks in Fortitude Valley and St Brigids in Red Hill. Many travelled on foot (a great distance). In 1901, following submissions to Archbishop Dunne from mothers of Catholic children, Mercy Sisters from All Hallows began providing religious instruction in a private home in Alderley. Later, the Archbishop offered land, which he owned in the area for the construction of a building in which classes could be held. The land offered by the Archbishop was considered too small for a church and school. The Catholic community began a search for suitable land. Finally a local Catholic, Mrs E Clugston, donated a property which she owned and the Archbishop purchased 2 adjoining acres to provide a suitable area. Following many fund-raising ventures St John the Baptist Church was blessed and opened on Sunday August 9, 1908. The church remained a Mass centre for several years. In 1913 St John the Baptist became a parish with Father Michael Gallagher as Parish Priest. He lived in the presbytery at Red Hill and travelled to Enoggera for Masses. The parish was vast in size, spreading from Enoggera Creek, Newmarket west to Samford and from Ashgrove to Albany Creek in the north. Archbishop Duhig purchased property, including 2 houses, about 1k west of the church in 1917. One house became the presbytery and the other a convent for the sisters who would teach at the school which he intended to build on the site. Our Lady of the Assumption School opened in 1919. Between 1913 and 1965 several priests served the parish, many for only a short time. Two notable exceptions were Fr Robert O’Donoghue, 1931-1951 and Fr Raymund Pender, 1953-1965. In 1931 a new presbytery was built in the grounds of the school (now the site of the Respite Care Centre). 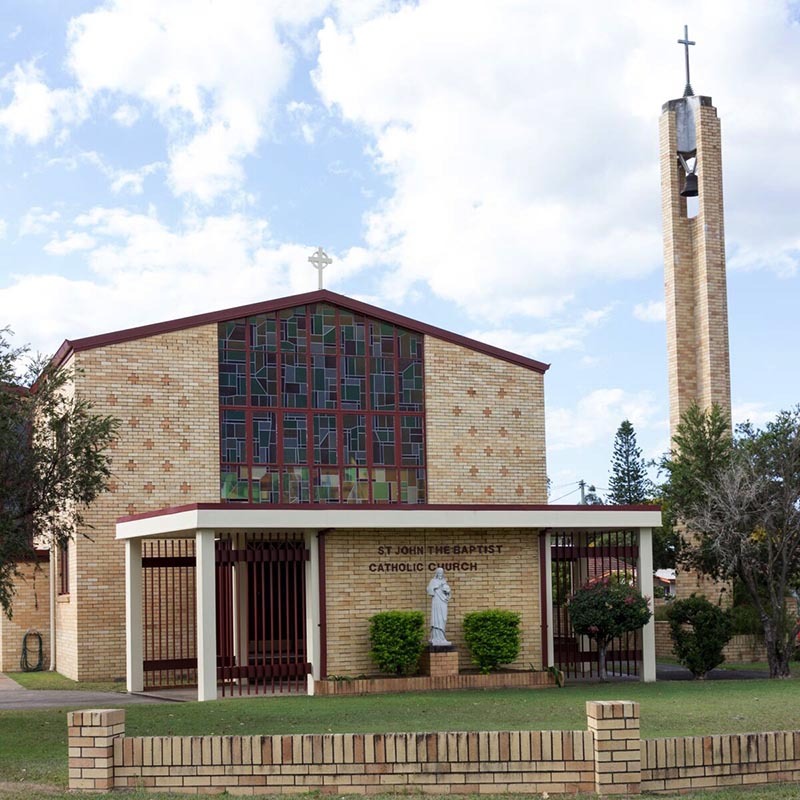 The parish was gradually broken up by the establishment of smaller parishes including Herston, Mitchelton, Grovely, Ashgrove, Newmarket, Dorrington, Stafford and, later, Albany Creek. The church was often overcrowded, and Sunday Masses were also celebrated in the school. The population of Everton Park was growing and Fr Pender decided that a church was needed in that area. Following fundraising efforts the church of Our Lady of the Immaculate Conception was blessed and opened on May 16 1960, on land donated by the Downey family. Fr Pender then embarked on his plans for a new church at Enoggera. Finally, on March 26, 1961, Palm Sunday, the ‘new’ church was blessed and opened by Archbishop Duhig. 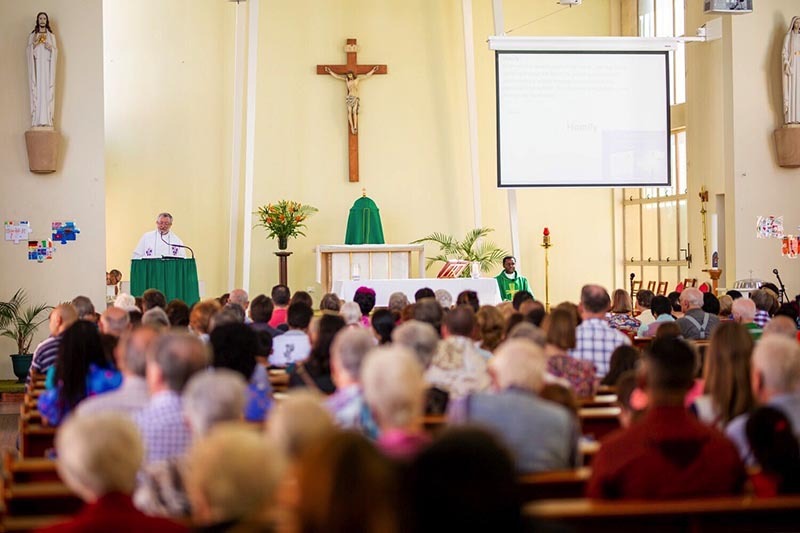 The Enoggera Parish was one of the first in the Archdiocese to introduce a planned giving program, the Wells Scheme, to raise funds for the two churches. Since then many priests have served the parish, most notably Fr Cyril Shand from 1965 to 1995. His vision lead to the relocation of the parish school to the present site closer to Hurdcotte Street, and the establishment of a regional boys’ school, Marcellin College. 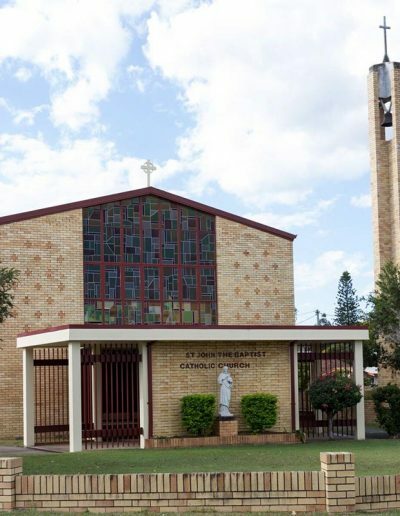 He was also instrumental in the establishment of a day Respite Centre and St John the Baptist Retirement Village, behind the Church, a project of the Archdiocesan Aged Care Office, which opens in 1995.